High flows on the River Eden during heavy rains and flooding in Carlisle in 2005 caused substantial river bank erosion in the vicinity of the high pressure Gas feeder 11 pipeline crossing. This erosion exposed the crown of the feeder main. Any future riverbank erosion could have undermined the pipeline, leading to the possibility of localised supply security issues if the pipeline were to fail. For safety reasons and to ensure continued fitness for purpose and compliance with National Grid’s Safety Case and the Pipeline Safety Regulations 1996, National Grid decided to divert the pipeline and re- install the crossing at greater depth. A design study was undertaken in 2014 to determine the best engineering solution. Horizontal Directional Drilling was considered the most viable trenchless installation technique from both an environmental and cost consideration. 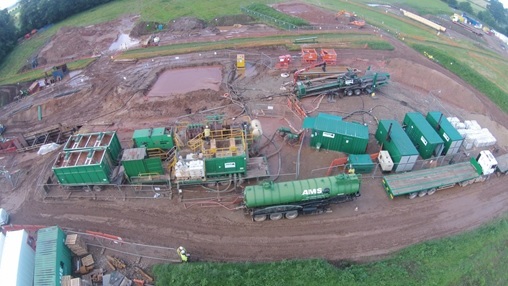 Following a competitive tender process PPS Pipeline Systems secured the main contract and in February 2015 commissioned AMS No Dig Ltd to carry out the trenchless installation on their behalf. The available site information indicated the ground conditions consisted of sand and river terrace gravel to 6m below ground level on both sides of the river overlying Sandstone rock formation. The 432m crossing was designed with a 1700m entry and exit radius with a 7 degree entry and exit angle to provide 5m cover within the Sandstone rock under the river bed with a maximum overburden of approximately 12m. 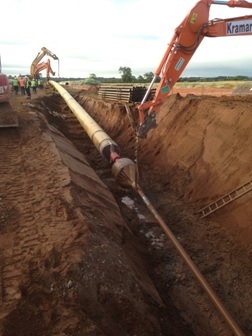 The pipe for the diversion of the 85 bar MOP pipeline was standard 914mm NB steel but with a heavier wall (19.1mm) in accordance with the institute of gas engineers IGE standards. AMS No-Dig’s Prime 250 tonne drill rig was selected to complete the installation together with high performance mud management equipment positioned both rig and pipe side of the crossing. Construction commenced at the end of May 2015 with the initial installation of a 180mm SDR11 MDPE mud return line to transfer drilling slurry from pipe side back to rig side during the main installation works. 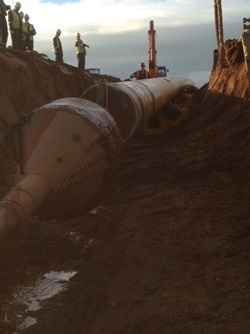 The mud return was installed 5m to the side of main drill route but on the same profile. Installing the mud return in this way gave AMS engineers invaluable information as to the abrasiveness and strength of the rock at the different elevations within the bore and provided guidance for tooling selection together with anticipated installation rates for the main pilot and hole opening processes. The main pilot was drilled with 6.58 inch diameter drill pipe, an 8 inch five stage mud motor fitted with a 12.25 inch Tri-cone drill bit. The final drilled length of 498m was 15% longer than the designed length of 432m, this being due to a slow build rate achieved on the exit curve to the reception pit. 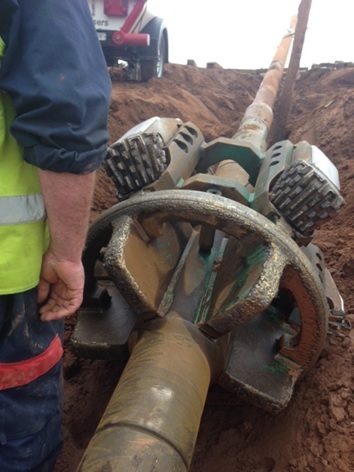 Both the mud return and main pilot were drilled using the same tooling, driller and steering engineer but with different results in terms of profile. This is a reminder that trenchless installations are not an exact science and it should be recognised theoretical design parameters cannot always be achieved. 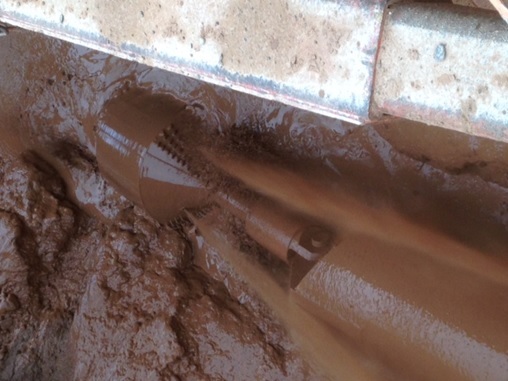 Even with robust design and state of the art steering technology available the success of any installation is governed by the physical conditions encountered below ground. Once the main pilot had been completed, the reaming and hole opening process was carried out in three stages using a combination of rock reamers with front and rear stabilisers to ensure even centralised cutting of the hole. The first stage was to open the hole from 12.25 inches to 26 inches followed by a second ream of 36 inches and third ream taking the hole to a 46 inches. Each reaming operation took seven days to complete working 10 hour shifts. The unstable ground above the rock strata was removed by piling and excavation prior to pipe installation; this was carried out by PPS Pipeline Systems.